Austria is the family and fathers-most hostile country in Europe! 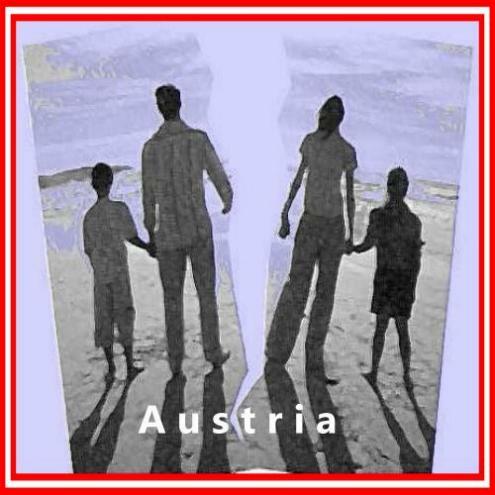 In Austria have only just 60% of divorced parents joint custody and this often meaningless after years of court hearings. Austria is thus one of the family u. Fathers hostile countries in terms of common concern !!! In a lecture in Vienna Institute for Marriage and Family on 23.10.2014 has a German family expert of the „fatherless society“ spoken here in Austria. Gabriele Heinisch-Hosek SPÖ and probably a Feminist Women’s Network are responsible for ensuring that the automatic joint custody (which is already written in the bill KindNamRäG, the former. Justice Minister was) was blocked and removed !!! Some judicial insiders claim that this feminist women’s network is also present in the judiciary and already has the greatest power in Austria? „Children need both parents,“ So shall continue as a foreign word in Austria. Prof. Dr. jur. Hildegund Sünderhauf, former divorce lawyer, scholar, and author of the 900-page scientific book „exchange model: Psychology – Law – Practice“ (2013), reported on 11.21.2013 at the 4th Federal Congress „Interdisciplinary collaboration in custody and access proceedings“ at OLG Dresden on the international state of research on „exchange model“ (or „double residence“), the Children’s basically the most relaxed model of care after separation and divorce of their parents. Switzerland has a law on the National Council decided in March 2015 where such exchange model (alternating custody) must be checked for all children of separation and divorce children by the court. In Austria, unfortunately, the SPÖ a Feminist Women’s Affairs Heinisch-Hosek Gabrielle is operated, which prevents the participation of parenting by fathers. 10 million euros are issued only for the Women’s Ministry in 2015. Men’s Ministry, there are none! Men are treated unequally and blocked with the family and with their children. The Feminist Women’s Ministry Heinisch-Hosek Gabrielle responsible blocking the good working families Ministry of Sophie Karmasin !!! The Austrian Party „The Greens“ has many feminist women who want to prevent joint custody for fathers. The common concern was the SPÖ negative manipulated the new Act-2013. All over the world including the „common concern“ the determination of the residence of the child. So both parents determine the child’s residence and must also determine the curfew of the child. In Austria, this provision shall Heinisch-Hosek feminist in the new law „KindNamRäG2013“ about the stay prevents the !!! Only the mother must decide on the child’s residence. The father should not have a say. The mother of Austria can be with the child at any time to move even abroad! The father needs to be „KindNamRäG2013“ not informed in this Act. Austria contradict this law the Convention of the Hague Convention on child abduction. Austrian politician in the National Council are corrupt and make laws against the Constitution !!! The children have a right to an education and care of father and mother. I myself have vorrige week with 2 fathers spoke, which wanted to commit suicide because of the separation and false accusation in court. One father has no parents, they are already death and therefore no one to talk. The sister of the entsorten father was initially prevent this suicide to happiness. The percent moderate proportion of suicides is 30% higher than in Germany in Austria.